Now that it is easier than ever to create your own non-fiction ebook and sell it online, there is also more competition than ever. Even if you write a book about a niche topic like training Labradors, as opposed to a book about training dogs in general (idea found here), you still might find a good amount of competition out there. Do a search on Google and you’ll see what I mean. So how can you compete? John (or Jane) Doe, Author of “Training Labradors the Easy Way” (with a link to your Amazon page or another site where you are selling your book). Of course the key is that your comment must be one that adds value to the site you are visiting. If you just try to advertise your book, that’s not going to work and it might even get you banned from using the site. This method does not generate oodles of traffic, granted, but at least it is targeted traffic. Those who click on your link are practically guaranteed to be labrador-owners who are interested in training their dogs. Another way is to turn your ebook into a print book. Yes, I know that sounds like something you don’t want to get your hands into, but there are POD (print on demand) printers out there who only charge for each book that you print. Take a small box of those printed books and go to veterinary offices and ask if you can leave them a complimentary copy for their waiting room. Include sheets of paper with your website on it where readers can order their own copy for home. Now all of that might seem like a lot of work, and it is. But it also gives you more writing material for your blog. Try a post like “My Experience at the Long Island Golden Retriever and Labrador Meetup”. (Please tell me you do have a blog. If not, start one!) And it helps you to learn about other concerns and needs labrador owners have. It also expands your network of Lab-owners which could lead to book sales further down the line as you continue networking. Your first tendency might be to concentrate just on how many dollars of profit you make off each book. But there are other ways to create income off of your book besides the sales of the book itself. For example, if you are so into Labs that you wrote a book about how to train them, I bet you could give some classes on the topic, too. Or maybe you have the space and yard layout to board labradors while people are away. Why would a Lab-owner chose a generic dog-sitter when you have expertise handling the specific type of dog that they own? The idea is to find numerous alternative ways to create income off of your non-fiction book. Obviously, these aren’t things that the big publishing houses are going to do. And they’re not things that most authors will do, either. So get out there! Meet people on the Web and in person who share your interests! And have fun selling your book and related services! 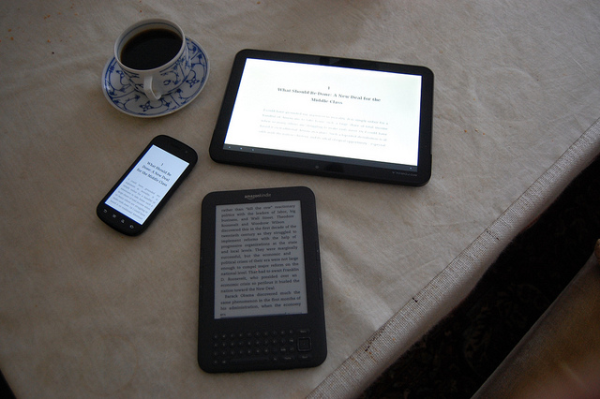 ePub vs. MOBI vs. PDF: Which format should you use for your eBook? If you’re an author, I’m sure you’ve considered self-publishing your book as an eBook. You’ve probably read some pretty inspiring success stories about authors who have sold a substantial number of books on the Web. And even those who haven’t sold very many at least were able to get them online and out in front of the public. That might not have happened if they were still trying to get their books accepted by acquisitions editors at traditional publishing houses. But deciding to self-publish an eBook seems to lead to a lot of questions, many of which we hope to answer in future posts on this blog. One of the first things you’ll have to decide is which format you want to use to publish your eBook. The most-common formats are ePub, MOBI (used on Kindle) and PDF. Try opening a PDF eBook on a phone and you’ll see the problem. PDF files contain t static text, so if there are 400 words on a page when you create it, there will be 400 words on a small iPhone screen. Obviously the text will be too small to read, so you’ll have to enlarge the page. And then you’ll have to move it around with your finger in order to read everything on the page. If you own an iPhone, try downloading our Tips for Authors Creating an Index which is available as a PDF. Or borrow a friend’s iPhone and try it out. You’ll quickly see what I mean. On the other hand, text in ePub books is not static. Instead, it flows. 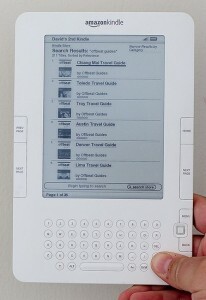 ePub eBooks display as much text as will fit on the screen, depending on the text size the user has chosen. So all the user has to do is read and flip pages. Very nice. MOBI does the same for eBooks on the Kindle. As far as the differences between ePub and MOBI, they are very different, technically-speaking, but not so different for the reader. ePub tends to format books in a way that looks closer to what the author initially sets up than MOBI does, especially with spacing. And MOBI files of same books tend to be quite a bit fatter, sometimes double in size. However, if you want to sell your book on Amazon, then it needs to be in MOBI format. Still unsure about which format you should use? If you want to reach readers who will read your eBook on their computer, then your best bet is PDF. If you want to reach those who will read on their iPhone or Android phone then you’re better off going with ePub. And if you want to sell to Kindle users, then MOBI is the format to use. But wouldn’t you rather reach them all? So why not make your eBook available in each of the three most poplar formats? Considering how cheap it is to produce eBooks, it makes sense to publish your eBook in a way that makes it accessible to anyone who wishes to read it.